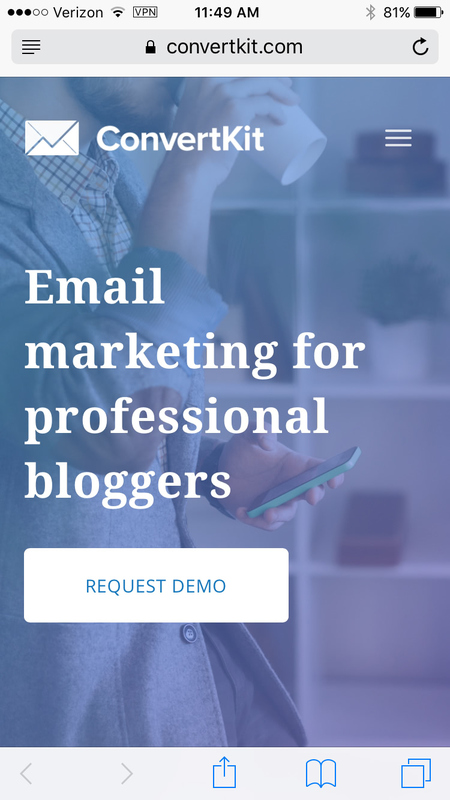 ConvertKit is a mailing list provider for professional bloggers. Mailing list providers are a dime a dozen these days, but ConvertKit stands out because it has a specific niche. They report on the state of blogging. They write on how to start & grow your blog. Their focus allows them to create a product that makes sense for the specific needs of professional bloggers. As a Draft Revise client, ConvertKit worked with us for 6 months to optimize every part of their public-facing conversion funnel, from home to pricing to signup. Through this process, we shepherded a wholesale redesign of the funnel and rebranding of the company – and ran a successful A/B test that boosted ConvertKit’s conversion rate (try saying that five times fast) by 19%. ConvertKit posts their metrics in public, and this graph shows one impact of our work together (plus/minus 1 month, for context): an increase of $200,000 in monthly recurring revenue. We also worked extensively with ConvertKit to develop their own A/B testing platform, which is currently being developed. The goal: to make ConvertKit the kind of email testing platform that a seasoned design expert like myself would want to use – with all the ease in usability that you’ve come to expect from ConvertKit. We’re tremendously excited to see how this turns out. You’re probably wondering about that 19% test. That was actually a brain-dead easy one on their signup form. Let’s talk about a different one that’s a little less intuitive – and a lot riskier: one that changed the primary call to action for mobile customers. ConvertKit has a whole growth team that’s focused on providing hands-on demos to anyone who requests them – which convert very well overall. So, what happens when someone opens what amounts to a highly featured B2B SaaS application on their phone? Well, they normally see a signup button. Who wants to take such a big plunge when they’re on their phone? Nobody. What share of prospective customers (those who have never logged in) are loading ConvertKit’s home page on their cell phones? Around two-thirds. So, we changed the primary call to action to request a demo – with a secondary button to create an account. Demo requests on mobile tripled relative to the control. And demos convert at an order of magnitude higher than ConvertKit’s overall conversion rate. This was a huge win for ConvertKit, as it helped grease the sales funnel they already had in place – one which had a very high rate of success. Are you a rapidly growing software business? You should strongly consider research-driven A/B testing for your funnel. Optimization can drive your conversion rates up a point or two. What can you do with that additional revenue? Apply for Draft Revise and find out today.